Architects are turning to one of the oldest construction materials to solve a new problem: how to build homes without damaging the environment. 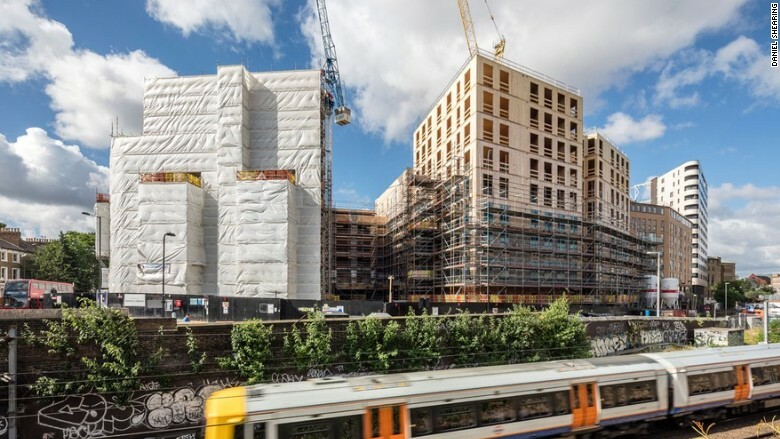 A London firm says sustainable timber could help the city address its housing shortage while reducing carbon emissions. "If you look at a building's climate footprint over 14 years, it is about 80% the building materials that go into it," Andrew Waugh, a founding partner at Waugh Thistleton, told CNNMoney. "We need to change the way we live for climate change." Buildings are responsible for approximately 45% of carbon emissions in the U.K. but very little attention is paid to the role of construction materials, Waugh said. Waugh Thistleton has just built a 10-story, 17,000-square foot structure entirely of timber in east London. They billed it as the world's largest construction made out of cross laminated timber (CLT), an engineered hardwood. The material, which the architects say isn't a fire hazard, is made by squeezing together sheets of lumber using a strong adhesive and a powerful hydraulic press. 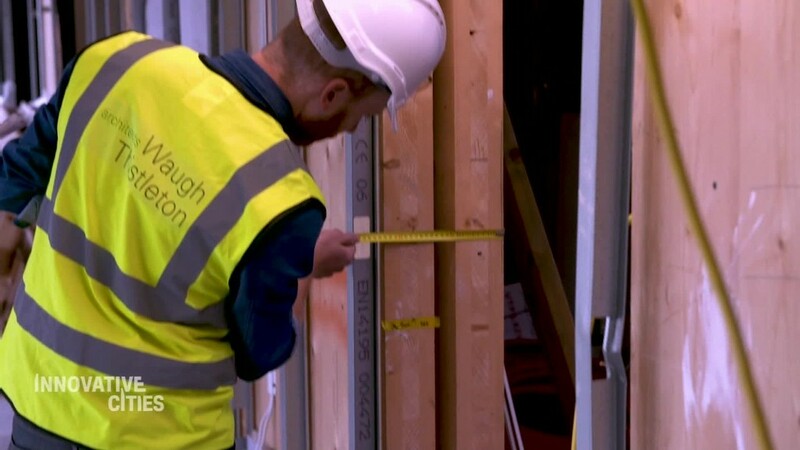 "Building up these cross layers of timber, that's what gives this panel its real unique strength," Waugh said, comparing it to cement or steel. His firm built its first timber tower in London in 2008, showing the material could be used for more than just small houses and primary school classrooms. Waugh Thistleton Architects says their Dalston Lane project is the world's largest construction made out of cross laminated timber. Timber is considered to be kinder to the environment than materials such as cement and steel, whose production generates large amounts of greenhouse gases and consumes lots of water and sand. Trees, on the other hand, are a renewable resource and replace carbon dioxide in the atmosphere with oxygen. Waugh's firm gets its timber from sustainably managed forests in Austria. The panels it uses are relatively light compared with steel and concrete, meaning less fuel is required to transport them to construction sites. That weight advantage also means more floors can be built on a single piece of land, providing more space for living in densely populated London neighborhoods. Timber buildings have thinner wall and flooring panels than their concrete counterparts, allowing larger living spaces. The density of the panels also helps keep heat in, which saves on energy bills. And though using timber in tall buildings might seem like a fire risk -- a particular worry in London after the deadly Grenfell Tower blaze -- CLT is fire resistant, according to Stora Enso, a producer of renewable materials. CLT chars, rather than burns, meaning it keeps its structural integrity for longer than some other materials such as steel.